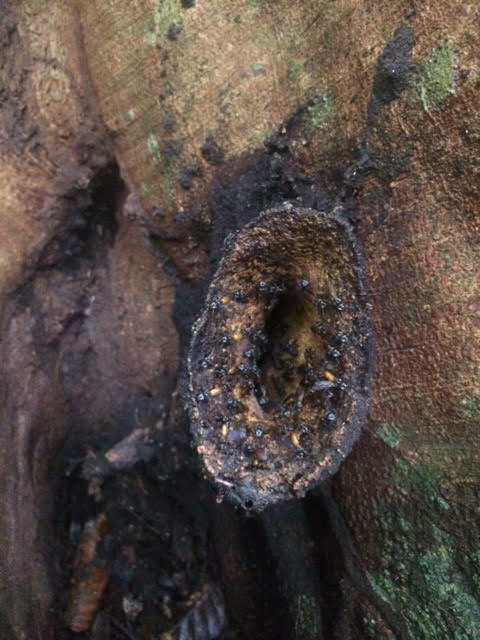 Sydney’s favorite stingless bee nest. Studying bees can be tedious work, but not because of needing to carefully avoid the stingers. The bees I’ve been observing (thankfully) lack them, making it easy to get up close and personal with my little buzzing friends. Rather than getting stung, this work is difficult because the nests are very challenging to find. I’ve learned that field biology is not just recording data vast quantities of data all day. First, the subject must be found to be analyzed, which is easier said than done. 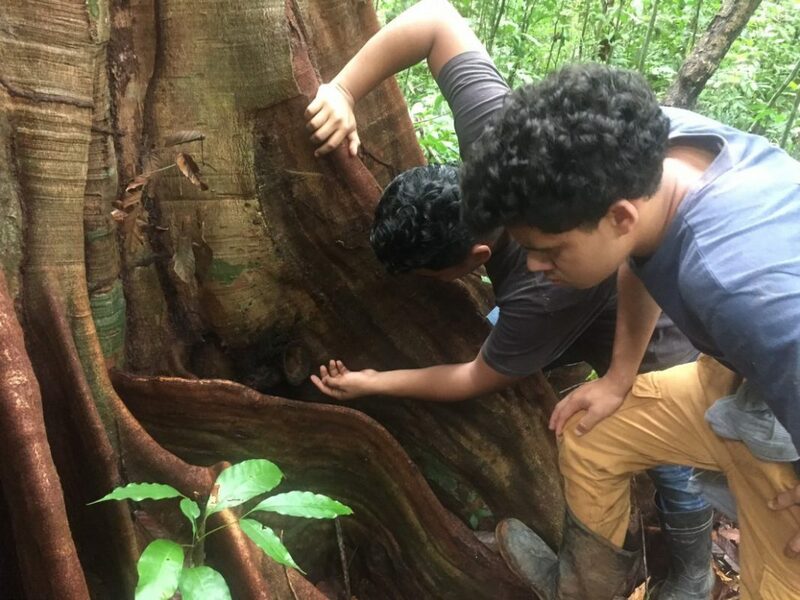 In the case of the stingless bees, romping through the thick jungle searching every nook and cranny for the small tube-like hives is the real challenge. The study is an exploration of the relationship between stingless bees and their local ecosystems and their role in pollinating native plant species, particularly vanilla. More knowledge about these bees could potentially lead to the harvesting of their medicinal honey by local farmers and conservationists. Johan and Luis point out a bees nest. It is as exciting as finding buried treasure when we spot one of the hives. My pencil glides across my field notebook to record the finding, and I get to work observing any behavioral patterns that could be significant to the study. I craftily set up a log bench at the base of a tree and observe a hive to really get to know the bees. Not knowing what might turn out to be important, I jot down any activity that could come across as useful information. I really feel like a scientist, designing timed experiments and collecting a few small samples to take back to the lab for identification and further investigation. The study is in its early stages, making it very open-ended. 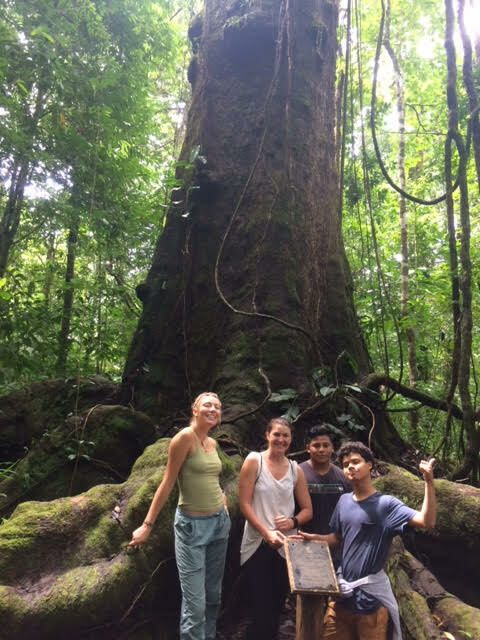 Hilary Brumberg (Rios Saludables program coordinator and the leader of our bee expeditions), a few other Costa Rican and international volunteers, and I brainstorm methods to make the study as logical and effective as possible. Having a say in the study design makes me feel involved on a whole new level with the team here at Osa Conservation. Equipped with my waterproof notebook, sample collection supplies, and hiking gear, the budding biologist in me is ready to take on the jungle and all its buzzing little critters. Bee team volunteers Sydney, Rachel, Luis, and Johan during an expedition. After six long months of the dry season, strong downpours have returned at last to wake the forest once more, and with them return the creatures that hid away from the rainless weather. The first glass frogs (Neobatrachia centrolenidae) begin to sing in the creeks and rivers, the water level gradually rising with the first floods of the year. 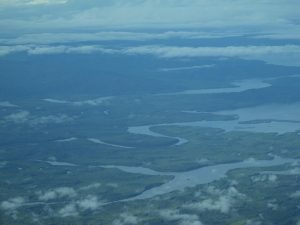 The rainy season advances across in a roaring song, and various amphibian species begin to search for water pools or swamps in which to lay their eggs. Throughout my whole time in the Osa, I most anxiously await the opportunity to watch the reproductive explosion of a species of red-eyed frog, the gliding tree frog (Agalychnis spurrelli). 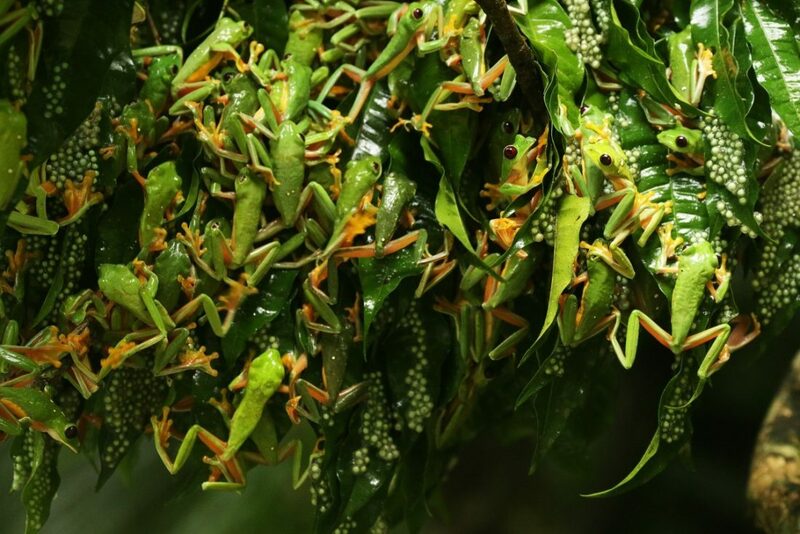 It’s an event that leaves me speechless: thousands of frogs congregate to lay their eggs. The first time I saw the spectacle, I stayed for the entire day, along with other animals that mirrored my interest; predators stayed day and night as I watched. For the past three years, I’ve visited this place annually and every time I stay for hours on end to see these frogs and contemplate the incredible species which we have in our forest. The rainy season will always be my favorite. 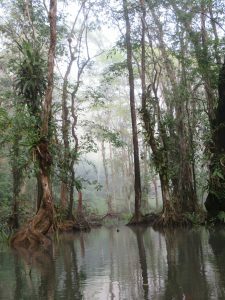 And even though the water might be a little much, that’s how our rainforest is sustained! This is a Blue Morpho Butterfly. This butterfly lives in tropical and neotropical (which are slightly drier) rainforests in Mexico and Central America, and throughout South America. 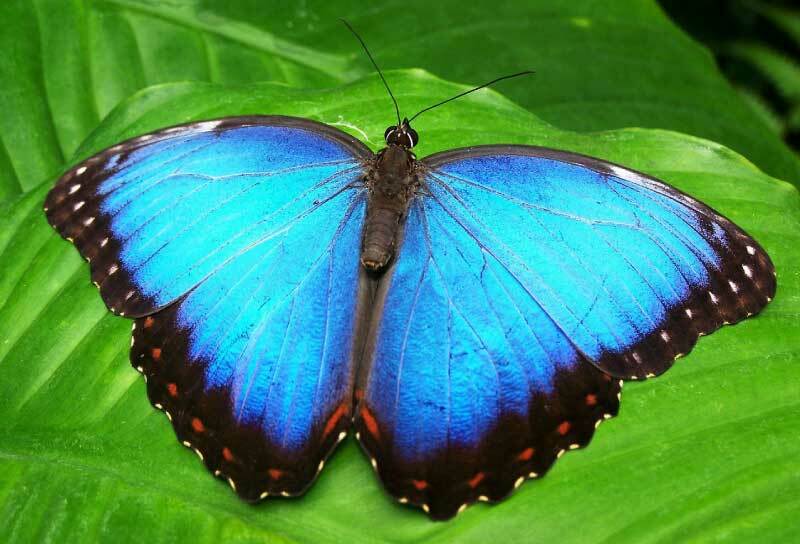 Although this butterfly looks blue, it has no blue pigment. It appears blue because of how its wing scales are structured. The wing scales are made up of cells that are shaped like Christmas trees. When light bounces off the “branches” of these cells, some of it bounces off the top and some off the bottom of each branch. The colors within the light waves then intersect and cancel out so they don’t reach your eye, except for blue light. The wavelength of blue light is the perfect size so that when it bounces off the “branches” the waves travel parallel to each other and reach your eye. But that doesn’t give them their incandescent blue. That’s because the scales also have cells that absorb green and red light to make it even more blue. While my family and I were with Osa Conservation, we built a puma skeleton that was found in a tree. The puma was a juvenile. The people who found it think that maybe this puma was hunting a bird or monkey, then it slipped and caught its neck in a “V” of the tree where it died. When we got to Osa Conservation, the puma bones were in a box. The “wild cat guy” with Osa Conservation, Juan Carlos, helped us start building the skeleton and was excited for us to finish it on our own. 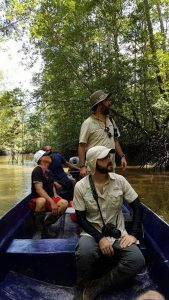 We started the second week that we were volunteering with Osa Conservation, and finished it a few weeks later. 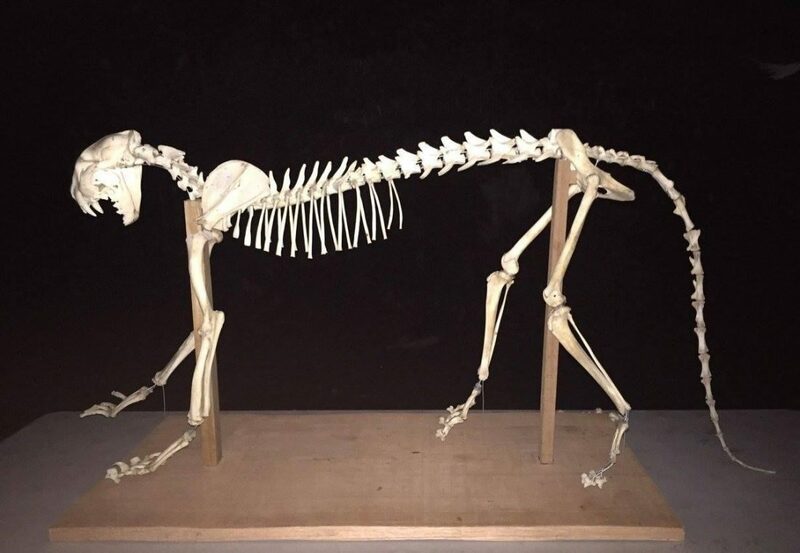 While we were building the skeleton, we learned a lot about the anatomy of cats and how perfectly all of a cat’s bones fit together. We also saw that the front foot was larger than the back foot. Also, behind the rib cage and ALL the way to the pelvis there are no bones! It was also really cool that because the puma was climbing when it died, I could see the retractable claws! The following week, we were going to construct a Tamandua Anteater skeleton that Juan Carlos had buried a couple years ago, but we couldn’t find where he had buried the bones or perhaps something had moved them!